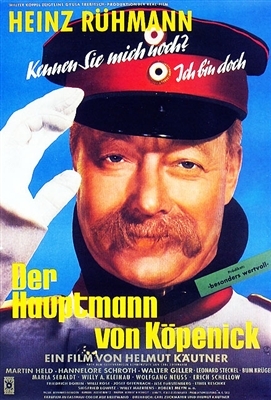 1956's Captain from Köpenick was the second film version of Der Hauptmann von Köpenick, a play by Carl Zuckmayer (the first was directed by Richard Oswald in 1931). 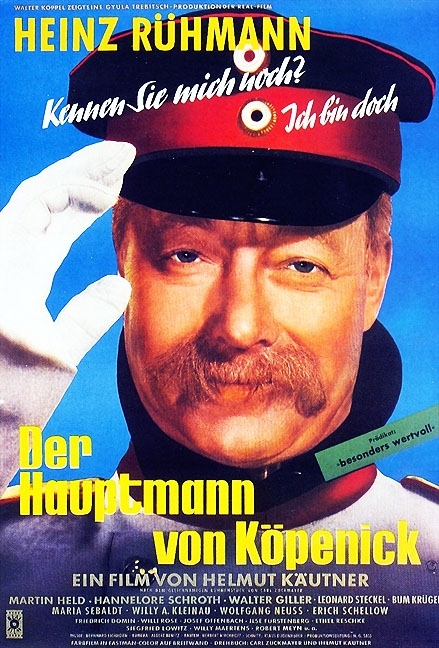 This fact-based seriocomedy stars Heinz Reuhmann as Berlin shoemaker Wilhelm Vogt, who in 1906 finds himself in possession of a Prussian military officer's uniform. Donning the outfit, Vogt struts about posing as a Captain, going so far as to declare martial law on the town of Köpenick, arresting the mayor in the process. Then he commandeers the town's cashbox and heads for the hills--as newspapers all over Germany celebrate his "scam". Helmut Kautner, director of The Captain from Koepenick, appears in a bit part as an organ grinder. Product arrive timely and in good shape -remarkably good visual and sound quality. Good readable subtitles.